Aside from Jan Franz, another Cherokee descendant puzzled by Armenian results was Marcia Dietrich, a customer whose no. 1 world match on an autosomal basis was enrolled members of the federally recognized Eastern Band of Cherokee Indians in North Carolina. “Because I grew up in Des Moines and only knew of my German, Dutch and Scottish ancestry, plus that splash of Native American, I never imagined having either Cherokee or Turkish/Armenian,” said Dietrich. Yet there it was. Armenian was reported as the third strongest megapopulation, after Iberian and Jewish, just before American Indian (no. 4). Armenian was no. 14 in her mix of European ethnicities; Turkish was no. 8. “Your test is not the only one to show Armenia and related results,” Dietrich wrote. “Family Tree DNA pegs me at 5% Asia Minor, which they show as Turkey and Armenia, while MyHeritage has me at about 2.6% West Asian, with my dad at 2.1%, mapping into Iran and Iraq.” Her mother, she adds, was the source of the Native American, but was never tested. Evidently, Dietrich’s maternal side was showing both Cherokee and Armenian, either conflating the two or suggesting that Armenian was a contributor to Cherokee DNA. How many others have the ghost ancestry that seems to haunt Cherokee families? Of the 62 mitochondrial profiles from Phase III of the Cherokee project, 36 also had autosomal profiles with DNA Consultants. Of these, 21 participants showed medium to high Armenian results (58%). In several instances, Armenian was no. 1 either in the world lineup or megapopulations. Ava Fink (participant 8) has a mitochondrial line classified as J2b1. The specific mutations match one of the ancient female founders of Ashkenazi Jews as well as the wives of Cherokee and Choctaw chiefs in traditional genealogies. In a story of secrecy familiar from other families, her mother’s mother concealed her Jewish roots, passing that knowledge only to the oldest daughter, whom she instructed to tell no one. Fink’s maternal grandmother was Mary Byers Nicholson Hines, born in Edinburgh, Scotland, in 1896 or 1897. Fink confirmed the connections with other Scottish Jews after studying When Scotland Was Jewish and Jews and Muslims in British Colonial America. Fink is not sure where the Cherokee enters into her family tree. A Cherokee population is no. 6 in her autosomal report. Armenian matches occur as nos. 18 (Garmon, n=95), 24 (Ararat Valley, n=105), megapopulation 4 and European 14. Donna Atkins (participant 16), another J, also has high Cherokee and Armenian matches, as does Don Barrington (participant 57). But the poster child for Cherokee-Armenian heritage is Julie Burton (participant 45), who is Ava Fink’s sister, and who has the same maternal haplotype (J2b1). Burton’s autosomal results are very similar to Fink’s, only more pronounced. She has Native American Minnesota populations in the top three positions, followed by Armenian Ararat Valley and Garmon (11, 45), Turkish (14, 15, 22) and Cherokee (24). Armenian is her top megapopulation result, whereas with Fink it was no. 4. American Indian is her second-highest. In her European country results, Turkish (n=500) is no. 6, and Armenian (n=404) no. 7. In her sister’s European rankings, Turkish was no. 1. If haplogroups are important for investigating autosomal results, the leading ones among the Phase III participants with high Armenian results are U (6), J (4), T (3) and H (2). These numbers reflect the frequencies of the overall project. They do not seem to correlate with the incidence of the same haplogroups among modern-day Armenians. To judge from the submissions to GenBank, Armenians greatly emphasize H’s (34%) and J’s (19%) and have few U’s (8%). The population structure in antiquity is not known but was probably similar to the modern figures since the Bronze Age. 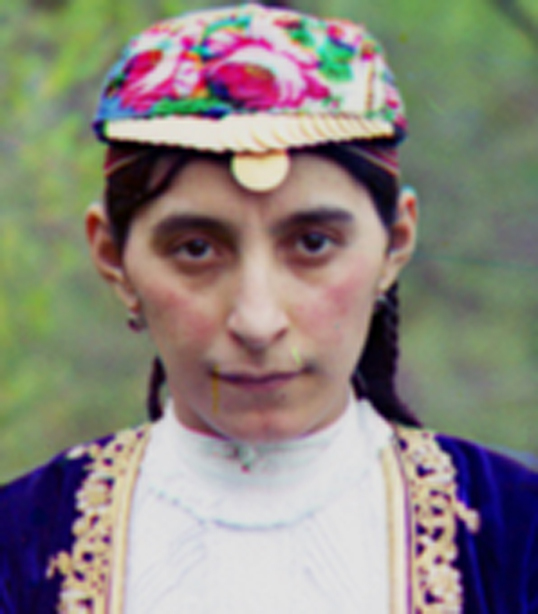 In addition to Cherokee, Armenian also makes a strong showing in those with significant Melungeon ancestry. In Donna Barefoot Atkins’ results (participant 16), for instance, where Melungeon is the no. 11 world match and no. 1 megapopulation result, Armenian is the no. 3 megapopulation. In a Mitzy Gann’s report (18), where Portuguese is no. 1 as in Atkins’, and Greek, Turkish and Melungeon occur, Armenian is the fifth highest megapopulation. A similar mixture is evident in Peter Lye Atkins (participant 28), Wendee Lowe (29), Sally Littleton (39), Gary James (42) and Robin “Hughes” Kelly (44). In all of these, Jewish matches also figure in. Romani or Gypsy matches are sometimes seen. The inference is that the very diversified Melungeon gene pool merges all these sub-populations, as was already proved in the Appalachian Journal study published in 2010, except that Cherokee and Armenian were not specifically mentioned by name. It makes sense that Cherokees contributed to the Melungeon mix since their colonial-period stronghold in the Overhill Towns on the Holsten and Tennessee and Little Tennessee rivers is close by Kingsport, Abingdon, the Watauga country and Newmans Ridge, which many Melungeons called home. But was that rather narrow region also the location of a separate Armenian influence? Nothing in the historical records suggests such a solution to the problem. Next in our examination of Cherokee-Armenian results let us have a look at Susan Dawson (6). Dawson is a T1 in mitochondrial lineage, one of the most representative of Old World types among the Cherokee. Both Cherokee and Melungeon are prominent in the picture of her ancestry provided by autosomal DNA. Armenian Lake Van (n=101), however, is her no. 1 world result and Armenian is her no. 1 megapopulation, by a long shot. Armenian is twice as strong in the probabilistic prediction of ancestry as her second result, European American. In statistical terms, Dawson has a chance of 1 in 3 versus 1 in 6 of having ancestry in common with Armenians as compared with having ancestry reported by other European Americans in general. Although Portugal, Northern Ireland and Scotland occupy the first three ranks in her European population matches—unsurprisingly, since her family considered its roots as largely or mostly Scots-Irish and Melungeon—Armenia is her next highest match (4). Among the U’s with Armenian results coming, so to speak, out of left field are Kristine Dupuis (5, with Cherokee=no. 8), Tonya Battin (25, Jewish=no. 1, Armenian=no.2), Sally Littleton (39, Turkish=no. 1), Gary James (42, with significant Greek) and Marcy Barrington (56, Armenian=Megapopulation no. 1, Armenian Lake Van=no. 1 in world matches). McFarlin’s maternal ancestry is H, a common type found across Europe and the United States and also reported in the Cherokee (together with J and a handful of other anomalous lineages). His ancestry was researched in census records in 2016. The maternal line was traced in unbroken fashion through several generations in North Georgia to Caroline Watson, born in the Carolinas about 1715. In another rare H1z1 haplogroup case, Karen Garruto (53), Admixed Cherokee (n=62) was in the no. 1 position, while the first three megapopulation results were, in order, Jewish, American Indian and Armenian, and there were repeated indications of Arab and North African admixture (Morrocan Arabs, Egyptian Berbers, Maghreb, Middle Eastern). Garruto had a rare Melungeon allele (D8S1179=8), which has been dubbed the Helen Gene and invariably entails matches to island populations. In her case, these include Malta, Sicily, the Canaries, England, Ireland and Majorca. Even in the single case of one Cherokee C lineage, Beth Katehis (62), whose autosomal profile produced the familiar amalgam of Portuguese, Sephardic Jewish, American Indian and Iberian, Armenian shows up as the no. 4 megapopulation and no. 15 European country of origin. Cherokees of anomalous and classic haplogroup affinity are alike. The conclusion is inescapable. Wherever Cherokee is detected, so is Armenian. The only questions are how old is the admixture and what is its proximate source. Several scholars have suggested that Croatian settlers were present on the Eastern Seaboard since as early as 1449 and later formed part of the ethnic mixture that became known as Melungeons (Eterovich 2003; Prazak 1993). Slovenian-American author Louis Adamic wrote extensively on the subject, but almost entirely in the Yugoslavian language, so little of his work passed into the mainstream. We thank Nancy Morrison and Evelyn Orr for this information. In the forensic scheme used by DNA Consultants, Croatian ancestry results are reflected by high matches in the following populations: Croatia, Southern (Split, n=105), Croatia (n=200), Montenegro (n=200), Bosnia (n=210), Bosnia and Herzogovina (n=171), Albanian – Kosovo (n=136), Albanian – Italy (n=100), Serbian – Serbia / Vojvodina / Montenegro (n = 100), South Slavic, Mediterranean European and certain other categories. According to this nomenclature, significant matches are found in the following participants: Tonya Battin (25), Peter Atkins (28), Julie Burton (45), Gary James (42), Robin Kelly (44), Robert McFarlin (32), Ann Mikell (37, only outranked by Scots-Irish), Marilyn Rae (43), James Sens (13), Marcy Barrington (56) and Christine Day (61, Albanian – Kosovo=no. 3). Although she was not a Phase III participant, Marcia Dietrich, whose no. 1 match was enrolled Cherokees and who had important Armenian and Jewish matches, had Croatian (n=105) as her no. 14 world match. She also had the following related European matches: 1. Albanian – Kosovo (n=136), 5. Bosnia and Herzegovina (n=171), 9. Montenegro (n=200). In the overall study there is hardly a single participant who does not have high to medium Croatian or related matches. The take-away is this. Cherokees, a surviving group of Southeastern Indians that took in many extinct or extinguished tribes such as the Catawba and Cheraw, are typically admixed with Melungeons, Jews, Croatians, Iberians, Scots-Irish, Turks and Armenians. U.S. Cherokee Enrolled (n=33) data are part of 31 tribes published in a major study by J. Ng et al, “Native American Population Data Based on the Globalfiler Autosomal STR Loci,” Forensic Science International: Genetics 24 (Sept. 2016) e12-e13. See D. M. Behar et al., “Counting the Founders: the Matrilineal Genetic Ancestry of the Jewish Diaspora,” PLoS One. 3/4 (2008) e2062. On the phenomenon of Jewish-Native American intermarriage, see my “Shalom and Hey, Y’all: Jewish-American Indian Chiefs in the Old South,” Appalachian Quarterly 7/2 (June 2002) 80-89. B. S. Akbasat et al, “Turkish Population Data With the CODIS Multiplex Short Tandem Repeat Loci,” Forensic Science International 123/2-3 (2001) 227-29. I. Yavuz et al, “Turkish Population Data for 15 STR Loci by Multiplex PCR,” Journal of Forensic Sciences 50/3 (2005) 737-38. F. Asicioglu et al, “Allele Distribution on Nine Short Tandem Repeat Loci for Turkish population: D3S1358, vWA, FGA, D8S1179, D21S11, D18S51, D5S818, D13S317, D7S820,” Forensic Science International 129/1 (2002) 75-77. Donald N. Yates and Elizabeth C. Hirschman, “Toward a Genetic Profile of Melungeons in Southern Appalachia,” Appalachian Journal 38/1 (Fall 2010) 92-111. Theodore G. Schurr, “Mitochondrial DNA and the Peopling of the New World.” American Scientist 88/3 (2000) 246-53. See Appendix C, I. “McFarlin Ancestors in North Georgia.” The specimen was submitted by his sister, Victoria Dian McFarlin. Hirschman and Yates, 103. Adam S. Eterovich, Croatia and Croatians and the Lost Colony 1585-1590 (San Carlos: Ragusan, 2003). Charles L. Prazak, “Were Croatians in the Carolinas before Columbus?” Carologue, A Publication of the South Carolina Historical Society (Summer 1993):18-19. On Croatians in early America, see also George J. Prpic, “Early Croatian Contacts with American and the Mystery of the Croatans,” Journal of Croatian Studies, Annual Review of the Croatian Society of America 1 (1960); electronic version by Studia Croatica: http://www.studiacroatica.org/jcs/01/0103.htm. The subject will be discussed at length in Chapter 6. M. Schanfield et al, “Allele Frequencies for the 13 CODIS STR Loci in a sample of Southern Croatians,” Journal of Forensic Science 47/3 (May 2002) 669-70. N. Haliti et al, “Evaluation of Population Variation at 17 autosomal STR and 16 Y-STR Haplotype Loci in Croatians,” Forensic Science International Genetics 3/4 (Sept. 2009) 137-38. ENFSI DNA WG STR Population Database v. 2. (str-base.org). M. Bodner et al, “Recommendations of the DNA Commission of the International Society for Forensic Genetics (ISFG) on quality control of autosomal Short Tandem Repeat allele frequency databasing (STRidER),” Forensic Sci. Int. Genet. 24 (2016) 97-102. R. Konjhodzić et al, “Bosnian Population Data for the 15 STR Loci in the Power Plex 16 kit,” International Journal of Legal Medicine 118/2 (April 2004) 119-21. Bosnia and Herzegovina (population 425): ENFSI DNA WG STR Population Database v. 2. (strbase.org). Milovan Kubat et al, “Population Genetics of the 15AmpF/STR Identifiler Loci in Kosovo Albanians, International Journal of Legal Medicine 118/2 (2004) 115-18. C. Robino et al, “Allele Frequencies for the PowerPlex 16 STR Loci in an Albanian Population Sample from Northern Italy,” Journal of Forensic Sciences 46/4 (2001) 998-99. I. Veselinović et al, “Allele Frequencies of the 15 AmpFl STR Identifiler Loci in the Population of Vojvodina Province, Serbia and Montenegro,” International Journal of Legal Medicine 118 (2004) 184-86.